In this recipe I used frozen Gnocchi. Just drop frozen Gnocchi in boiling water and cook same way as fresh. Do not thaw or they will stick together. Sauté chicken tenders or skinless and boneless chicken breast cut into strips for about 3 minutes on each side, steam or microwave broccoli, heat up tomato sauce. 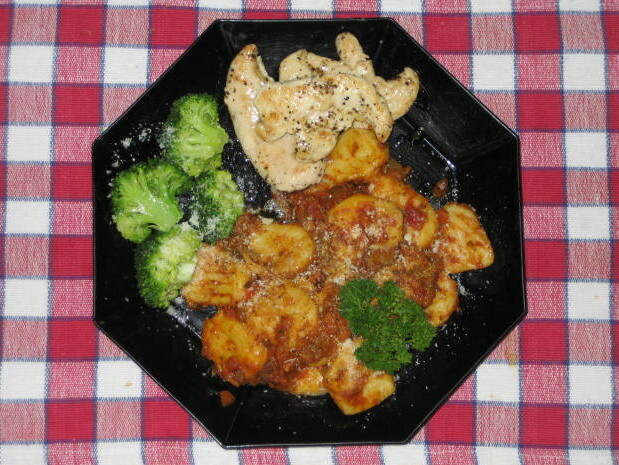 Toss Gnocchi in the sauce and serve with chicken and broccoli flowerets on the side. Sprinkle with grated parmesan cheese. Meal is ready in 15 minutes.